Site Really Does Matter | Faddegon's Nursery, Inc.
Jun 1, 2016 | Garden Tips, Perennials, What's New? As a willful and unapologetic hosta addict, it’s so easy on my head to simply add hosta to every blank space in my shade garden. It’s fun to plant something so consistently spectacular, right? Layers of fern and hosta – a no brainer! 2 years ago I made a discovery ….. Gold Heart Bleeding Heart. We have carried this plant for so long, for Pete’s Sake …… it sat on the benches right in front of my eyes!! What took me so long? You know how you think you know something but you really don’t? Guilty! I had this image in my head of a plant with fleeting blossoms and foliage that literally disappears in the summer. 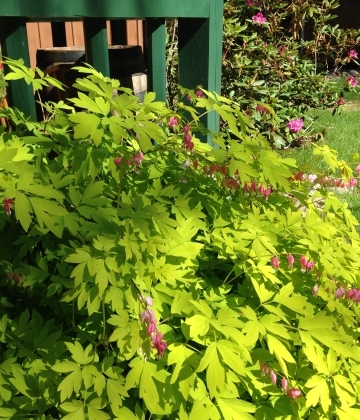 Tag said Bleeding Heart … I dismissed it … then I tried it… LOOK! Beautiful right? Literally 100’s of blossoms! Fairy Tale ending to the story! Cocktails anyone? Yeah, total failure. You can see it’s under the shade of that big Oak Tree but it gets afternoon sun instead of morning sun. You know how you think you know something but you don’t? Do you know how many times I have counseled customers that SITE REALLY DOES MATTER! So, be still my gold heart and only stay on one side of the driveway.